Whilst legendary toy makers Mego are probably most famous for their 1970s 8-inch line of comic book characters the World's Greatest Super Heroes, some of their most highly collectible figures today are a very different range of swashbuckling literary and historic heroes – The World's Greatest Super Knights! Ivanhoe here, was released alongside the Black Knight, King Arthur, and his knights Sir Galahad and Sir Launcelot, in what was a spectacularly detailed series of beautifully made action figures. What impresses most about all the figures in this series is the sheer attention to detail. Using characters which were in the public domain clearly freed Mego from the expense of licensing fees and allowed them to spend more on the figures themselves. 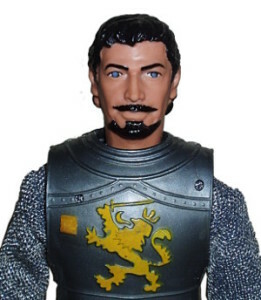 The facial sculpt bears a remarkable likeness to the late actor Robert Taylor who had played the title role in Ivanhoe, Richard Thorpe's 1952 movie based on the Walter Scott historical novel, whilst his costume would be seen as a deluxe edition even by today's standards, with its full chain mail effect bodysuit, plate armour, boots, helmet and accessories. The costume, in fact, is clearly based on another Richard Thorpe movie Knights of the Round Table, which also starred Robert Taylor, this time playing the part of the equally chivalrous Sir Lancelot. My Ivanhoe is missing his red lance, and the red feather plume from the top of his helmet, but he still has his red shield with the yellow lion insignia – all faithfully reproduced from his Lancelot movie costume. 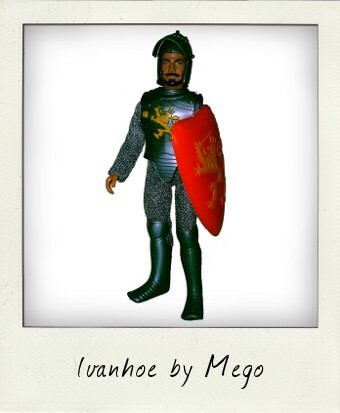 The Mego design team clearly thought the Ivanhoe costume a little too staid! Standing the usual 8 inches in height and built with a typical Type 2 Mego body with plastic joints and 14 points of articulation at the head, shoulders, elbows, wrists, waist, hips, knees and ankles, this figure's joints are still nice and stiff and he stands easily unaided. Apart from some missing accessories, such as the spaulders for his shoulders, the figure itself is in excellent and clean condition. 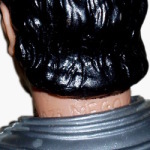 The plastic breast plate is glued tight – there's no way of removing it or checking the back of the figure for copyright information, but this figure carries the Mego name on the back of his neck, just visible above the armour. The knights figures first hit toy shelves between 1975-1976, but his head is actually date-stamped a year earlier © 1974. Being a European loose action figure find it's likely that the original boxed version of the figure was distributed by Baravelli in Italy. A fabulous vintage Mego action figure and superb display piece! looks like wonderfully crafted piece. Looks better as a figure then it does in the movie.